Having seemingly fallen out of favour at Real Madrid under Fabio Capello, David Beckham raised more than a few eyebrows when he announced he’d signed a deal to move to MLS and see out his days at Los Angeles Galaxy in January of 2007. Shortly after Beckham announced his intentions to swan off to America, Real president Ramon Calderon was publicly dismissive, intimating that the England midfielder was a busted flush and would be nothing more than an “average cinema actor living in Hollywood”. Five months later Calderon was singing an altogether different tune, telling the press he’d be “delighted if Beckham stays” following a dramatic return to form. Real attempted to bargain with Galaxy. Galaxy stood firm. Becks made the switch to Los Angeles that summer. With several top European teams said to be chasing him, Beckham’s lucrative move to MLS was very much seen as a bit of a ‘semi-retirement’ cop out. 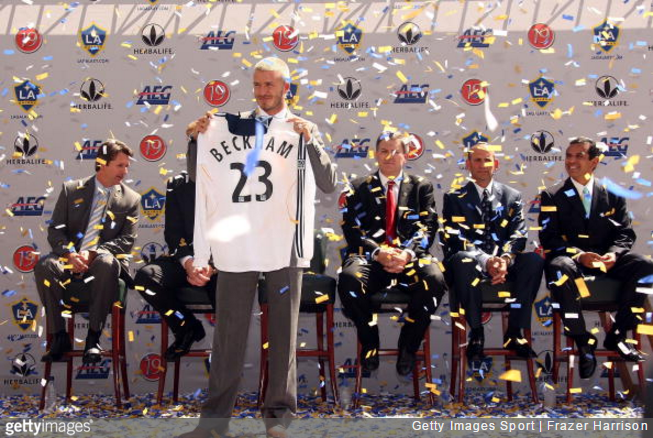 Most observers felt that Becks had at least a couple more years at the top level left in the tank, but the five-year Galaxy deal worth $250million (£180million) almost certainly made up for any regrets the man himself had over his career trajectory. Beckham’s wages constituted 20% of that total, with the rest coming from sponsorship, merchandising and a guaranteed slice of the club’s profits that was written into his contract. By the time he left the club permanently five years later, Forbes magazine estimated Beckham had earned $255million during his time in MLS. Not a bad little boost for the pension pot. It was not a bad choice. Won it all at United and played for Real as well. Not much you can do after that. Plus, Gerrard, Lampard, Pirlo, Kaka, Henry, etc etc only went there because Beckham put the USA on the radar.